I've been unmotivated to check out and especially start to actually listen to new songs lately, which has resulted in my chart becoming a bit static. This has happened dozens of times before, but rarely since I started posting my chart here. This made it easier than it would have been otherwise for "Paralyzed" to return to #1 on its 53rd and final week. With six weeks total (2 + 3 + 1) at #1 the song is at #27 (tied with seven other songs) for all-time total weeks at #1 on my chart. It's also the 39th song ever to reach the maximum 53 (or very rarely 54) weeks. See chart run graph below. 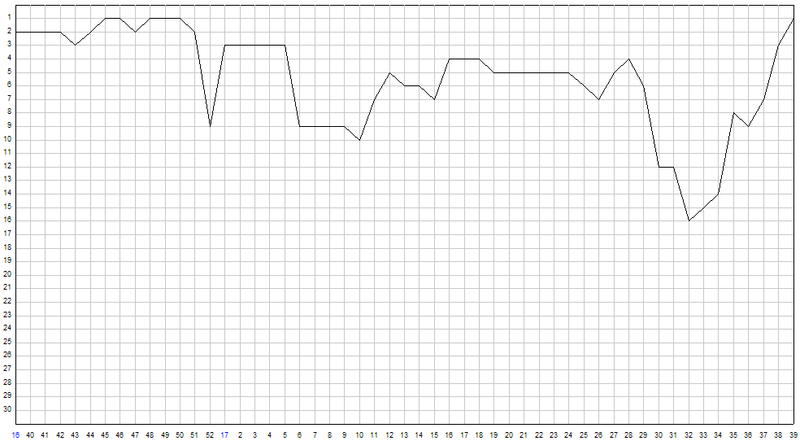 Final Chart Run for "Paralyzed"
Not much going on here either but WATCH OUT FOR AMY! I didn't like it that much at first, at least not the chorus. I still think the verses are much better than the chorus and despite the #4 position I would not rank it as one of their [Aly & AJ] best songs. …which would mean you would recommend their earlier stuff? I never heard a thing about them so far, not even that single which was a success, so maybe I really should check them out. Cool that we have the same favourite on the album! This was my clear favourite from the first time I listened to the album and despite not reaching the top 3 it was actually rather close to #1 the first two weeks; i.e. the top 3 songs were only a little bit ahead (I think!). And while I said “Schönster Moment” is probably my favorite song of her album a few weeks ago, it’s now clearly my most favorite song ever by her. I so love it! It’s currently my 43rd most played song of 2017, which is quite impressive for a song that never got released as a single. There are only 8 non-singles above her, and six of these are by Halsey who has a huge success with her album on my charts so far. Interesting… how is it to study Russian? I imagine it to be quite difficult, isn’t it? As you probably saw, I really enjoyed your FSC entry. “Du' kærlighed for mig” is a sweet song and I was shocked it didn’t do better in the ranking :( I found no information, but it’s not an official single, is it? I added her whole EP to my library but have yet to listen to it. Yes, definitely check out at least "Potential Breakup Song", and if you like that the full second album (Insomniatic), and then the debut (Into the Rush). The first album did better than the second for me; their debut single "No One" (which first appeared on the soundtrack for the movie "Ice Princess", that also included my 2005 YEC #1 and #2, Hayden Panettire – I Fly and Diana DeGarmo – Reachin' for Heaven, the later of which is also the only song lucky enough to spend 54 weeks on my chart) is still my most played song by them although I'm not sure it's still my subjective favourite. Other favourites are "On the Ride" and "Never Far Behind" (which wasn't on the original version of the album but released later in 2005) and from the second album "Flattery" and "Silence". That's great to hear! It's too bad you stopped doing the "Airplay" chart. I don't allow myself to find out where it is in my ranking for the full year, but it was my 9th most played song the 3rd quarter, and 6th if only songs from 2017 are counted so it's almost guranteed to be in the top 50 on the YEC, and probably the top 30. Yeah, time passes so quickly... It didn't become #1 until November though, so maybe that's why it feels like it hasn't been a year yet. Maybe it would have done better if the majority of people who voted could understand the lyrics, but competition is also quite tough and I've noticed my taste is a bit different from that of the average participant. No, it is an official single, even though it doesn't have a "real" music video and probably didn't get much promotion. I'm glad you like it and decided to check out the EP! Single covers for the Estonian and the English version of the returning #1. Last week's #1 is replaced by another ";old"; song that has been gone for 32 weeks but now ";randomly"; reappears at #1! It still has one more week to go before it becomes ineligible (thanks to getting its first play on a Sunday and entering that same week; if it had never left the top 30 it could have become the second song ever to spend 54 weeks on the chart). Maia's ";Du' kærlighed for mig"; finally leaves the top 3, and even if it returns there next week and stays until February it won't be able to improve on its number of consecutive weeks in the top 3, which means that #4 is its final position for all-time consecutive number of weeks in the top 3. It also means that the top 10 for all-time highest number of consecutive weeks in the top 3 (see below) can't be changed until at the earliest some time in early 2018. ";Voices Carry"; by Katy Rose reaches a new peak on its 13th week on the chart and ";Space Between"; reclaims a position in the top 10. And ";Après l'aurore"; reaches its highest position since week 26. Taylor Swift is annoyingly stuck at #6 for the 4th week (this ought to be worth at least half a point for the UKMixParade chart, no?) But where are all the new songs? Even the new entry ";Downtime";, er... ";Downtown"; got its first play almost four months ago. 2017 is dead (at least for now). Some of my favourite albums from decades past seem to be taking over the albums chart. Swings and Roundabouts improves on its record for number of weeks at #1 from 136 to 137. It was last #1 in early May 2013 (right before Emmelie de Forest's album was released) so this is a rather big although not surprising comeback for the album that spent 124 consecutive weeks at #1 (from October 2009 until March 2012) and where the average number of plays for each of the 15 tracks is north of 6,000. Only one other album has even one song above that number. With numbers like that, even though the album had a strong week compared to recent years it still performed (in terms of plays) noticably worse than for an average week since its release! Hye Magnus, very nice to see that Grete Paia is back on your top position. Still a great song. Back to the music again. I have a few songs and weeks to catch-up with your charts. Will let you know later. I'm afraid football is rather far down on my lists of interests, but I do watch some big games occasionally (although I forgot about this one). 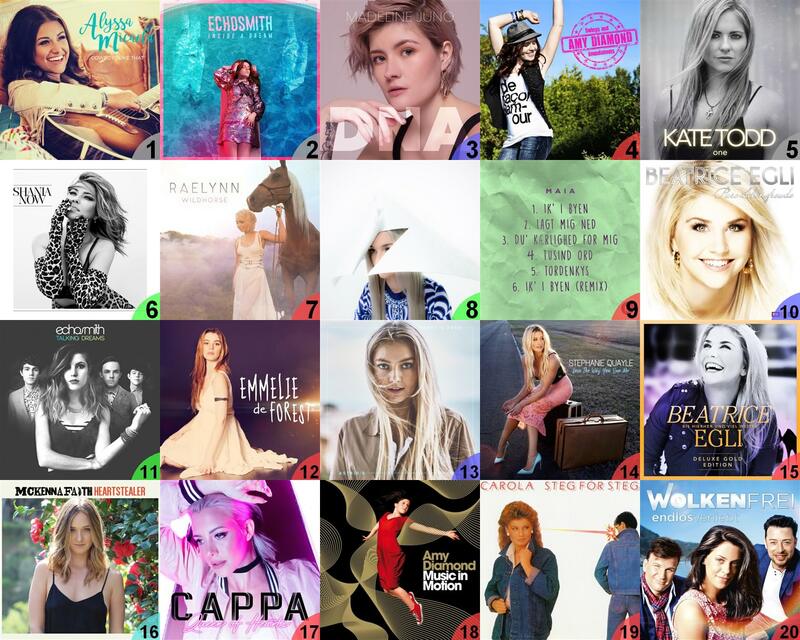 Looking forward to hearing if you found some new favourites among the songs on my chart! EP and single covers for the new top 3. Single, (not-yet-released) album and EP covers for five of the other six new entries. ^ Thanks, didn't know about this yet! Yes, definitely very interesting. Will listen asap! Interesting fact about the 54 weeks – how did this happen? Ha, yes, that was a case where an airplay chart would have been very interesting, I even thought about that by myself a few weeks ago. “Schönster Moment” was easily my most favorite song for about two weeks, so if it would have been a single it would have been #1 on my charts. At least it pushed her album to a new peak on my charts. I really hope it gets a single treatment in 2018. Oh, that makes it even more interesting. So you were just interested in learning the language, or is there a reason why you picked Russian? Amazing comeback for Grete Paia! I still remember that song very well from when its first chart live started as I really liked it. Glad it came back with a bang now. Probably no surprise, but I absolutely love to see Marina Kaye entering your charts with “Merci quand même”! She just released her second album “Explicit” on friday, and it’s another good one. I already wanted to ask if you liked the stuff from her debut album, then I saw her discography and my question already got answered, just not in the way i was hoping for Did you check out her debut album in full back in 2015? I agree about "Herz an", but I like "Keiner küsst mich" more, even if that too is some distance from her best songs. But still looking forward to the album of course! I completely understand about the problem with checking out older stuff when there are so much new music to listen to, I have that problem too and usually I only check out older albums when there is some specific reason, for example when the artist has released something new I like a lot (which just happened for Echosmith, had never listened to their debut album before). So don't feel any pressure that you have to check out those albums. Great! Yeah, I also hope it will become a single, even if it doesn't matter for my chart (but could result in a nice video). Yeah, it followed the trend that the biggest songs of the year (it was #6 on the YEC) tend to get a lot of plays again when they are just about to become ineligible (even it that is only part of the reason). And it seems it got an extra boost from being "forgotten" for a while, unlike "Nirvana" and especially "Paralyzed". The decline has probably started now and I agree about "Gorgeous" not being too strong; it's possible it might reach my chart next week but it has made me less excited for the album :(. I did like several songs on the debut (and I don't recall any song being bad) even though only one of them (and just barely) reached the top 30; I discovered her when competition was very strong. I was going to listen to the new album over the weekend but somehow forgot... Definitely going to happen this week though. EP and single covers for the unchanged, very strong top 3. This week's six new entries (single, album, B-side, EP covers). Hye Magnus, Thanks for your comment. Nice that you hoped I would comment on the return of Grete Paia. She has already left the top 30 again. Great new music in the top from this week. So I understand it can't always be the same songs from the past. Was it luck though or some kind of sixth sense that I checked your top 30 on the moment that Grete Paia returned on nr. 1. I don't actually checked your chart every week :( . the past few months. So it was a nice surprise that she returned on that moment. I also totally agree on your interest in football. It only has my interest when a big game is being played. But because it was Sweden against the Netherlands I thought on you. As promised I checked your whole top 30 from this week. I will comment in a new reply. And now here are the comments of the dutch fans. Magnus 12 points. A little joke, but I must say when I listen to your chart I'm always surprised in a good way about the beautiful an mostly unknown music to me you have found. The song I enjoyed the most from the chart is for Echosmith "Get into my car". Really a great song. Will be found in my playlist. But also on my list of really great or at leat really nice songs are: Alyssa Micaela, both songs "Clean Break" and "Getaway Car", Maia with also both songs. 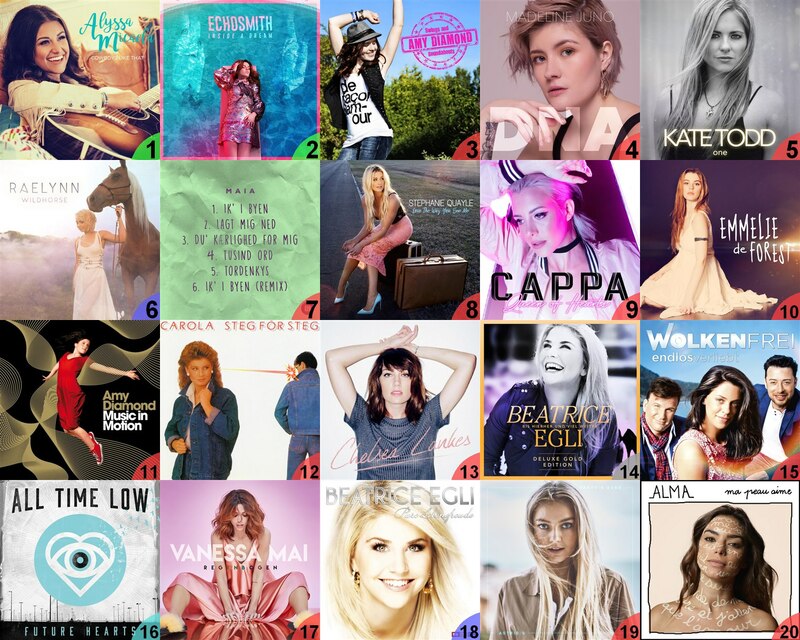 And then at the bottom of your chart really great songs I think are: Alma – Après l'aurore, Aly & AJ – Take Me, Katherine McNamara – Ember, Astrid S – Think Before I Talk and Jana Kramer – I've Done Love. I'm a bit fan of Jana and have also a weakness for Astrid S. New for me were Aly & Aj, but I loved the song. Same goes for Katherine McNamara with a very nice song Ember. Alma I knew already a little bit, but loved the song. Al these artists I will listen to a few times more. 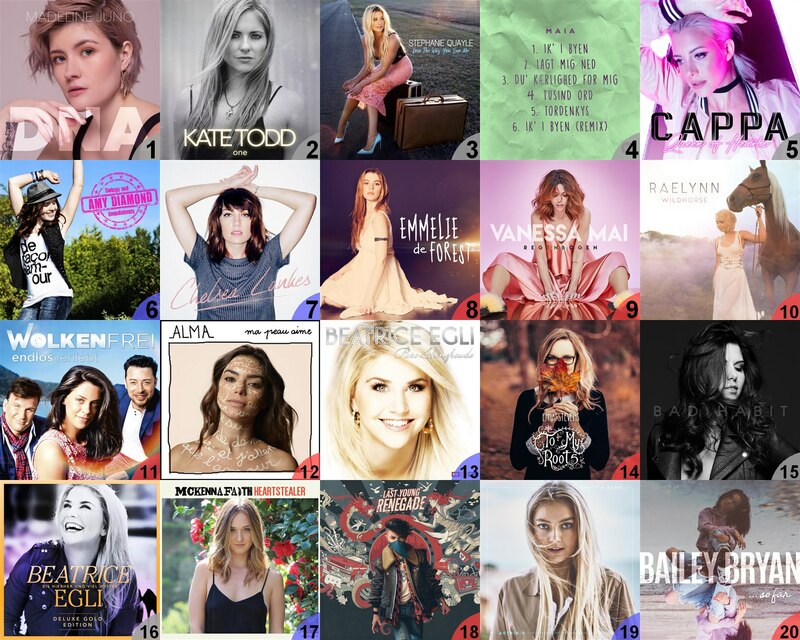 Then their was a catagory of songs that I found were very nice: Catherine McGrath – Talk of This Town, Scavenger Hunt – Eyes Wide Open, Kellie Pickler – If It Wasn't for a Woman, Marina Kaye – Merci quand même, Stephanie Quayle – I've Got Your Six, Sofia Carson – Ins and Outs, Dove Cameron & Sofia Carson – Space Between. Really enjoyed Kelly Pickler and Dove Cameron with Sofia Carson. But also Eyes wide open from Scavenger Hunt was very good. The songs that aren't my taste were: Phoebe Ryan – James Has Changed and The Dark Element – My Sweet Mystery. Found this last song my sweet mystery a heavy song. Thought it could be nice to get loose, but after hearing to Aly & Aj I thought that song does it more for me. The rest of the songs were just nice. Ofcourse a little plus for Vanessa Mai. I do actually like her new album a little bit more than her solo debut album. The second "Regenbogen" made me listen to "Fur dich" another time. It became a little bit better. Beatrice Egli isn't yet in my fan playlist, but the song "Keiner küsst mich" is nice and her new single "Herz an" I find really likeable. Als just nice but als nice to see in your chart I found ??? ??????? – ?????? ?? ????. 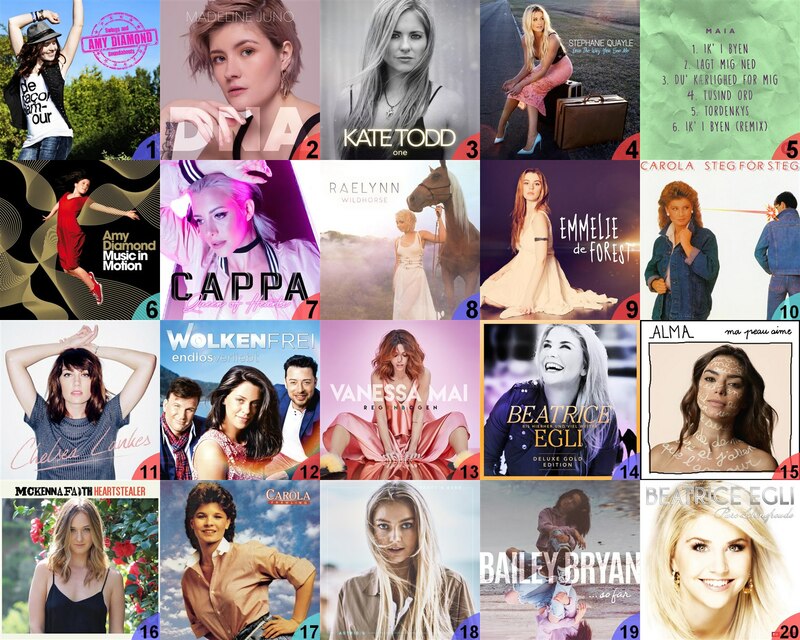 Listened also to it and I recently got my interest in the charts from Czech Republic and Slovakia and found in those charts also very nice music from good artists unknown in the rest of the world. I don't think ??? ??????? – ?????? ?? ???? is from those 2 country's, probably Russian?? ?, but I like it that it's not common but just very nice or good music to listen to. In one of my earlier posts I mentioned that Schlager was just like Country music. And you replied that you couldn't find the simularity in those 2 different kind of music. I agree with you that those kind of music isn't the same but I ment with my comment that what Country Music is for the Americans is Schlagermusic for the Germans. It's the music that belongs to a country. In the Netherlands we have some kind of schlagermusic but it's different from the german schlagermusic. We call it "Levenslied" or in german "Lebenslied". There is not really a good translation in English. It would be Songs about life. A good example would be: Andre Hazes (1984) V or Jan Smit (2017) V.
Is their in Sweden also a kind of music that's typical Swedish? Thanks for commenting, Speedy and heppolo! Yeah, you're right, songs more than a year old (usually measured from when I first heard them) are not allowed to chart anymore. 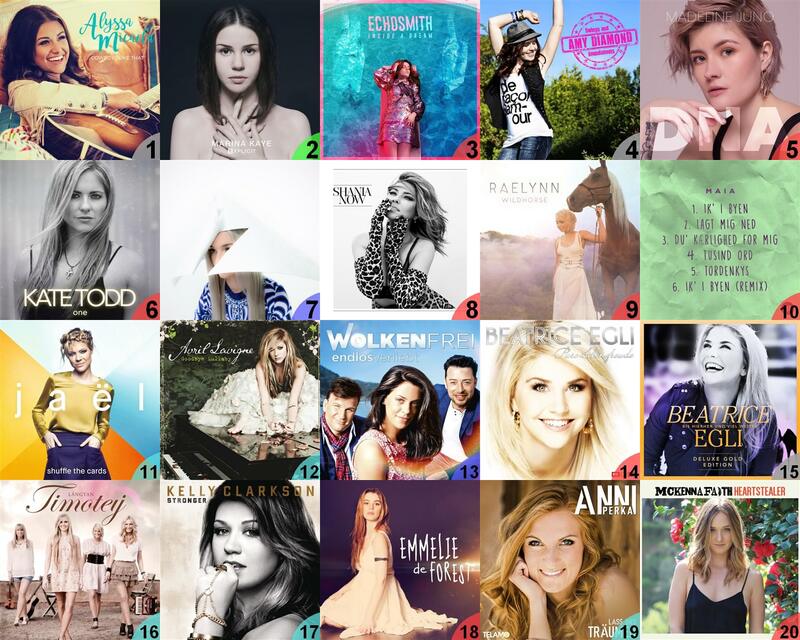 Otherwise Grete would still be in the top 10 (last week at least)! I'm glad you like the new entries! That's great to hear! Yeah, "Get Into My Car" caught me by surprise, didn't expect to hear such a great song from Echosmith. It's unlucky that the current #1 and #2 are also very strong for me, would have been a clear #1 otherwise. Thanks for checking out all of those artists/songs, and I'm really glad you like most of them and especially Alyssa and Maia! "My Sweet Mystery" is a little but untypical for my chart but I still like it a lot, especially the verses. (Tansike's impact on my chart ). I'm curious about the music from Czechia and Slovakia that you are mentioning. 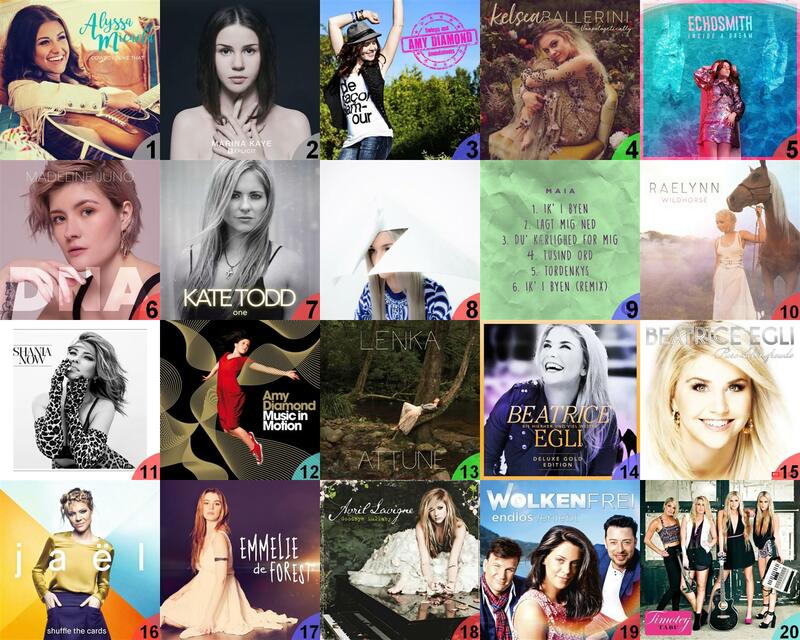 I know very little music from those countries (basically only what happened to be in the ESC). Ah, I see. Yeah, that makes a lot of sense. I'm glad you like it! It is very good indeed. 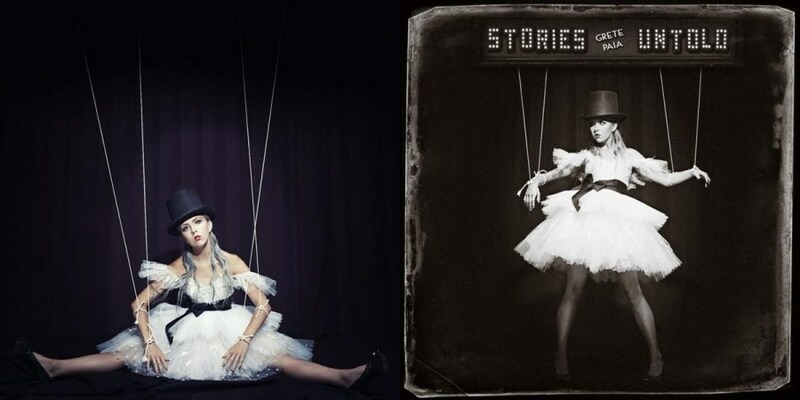 EP and single covers for the still unchanged, still very strong top 3. 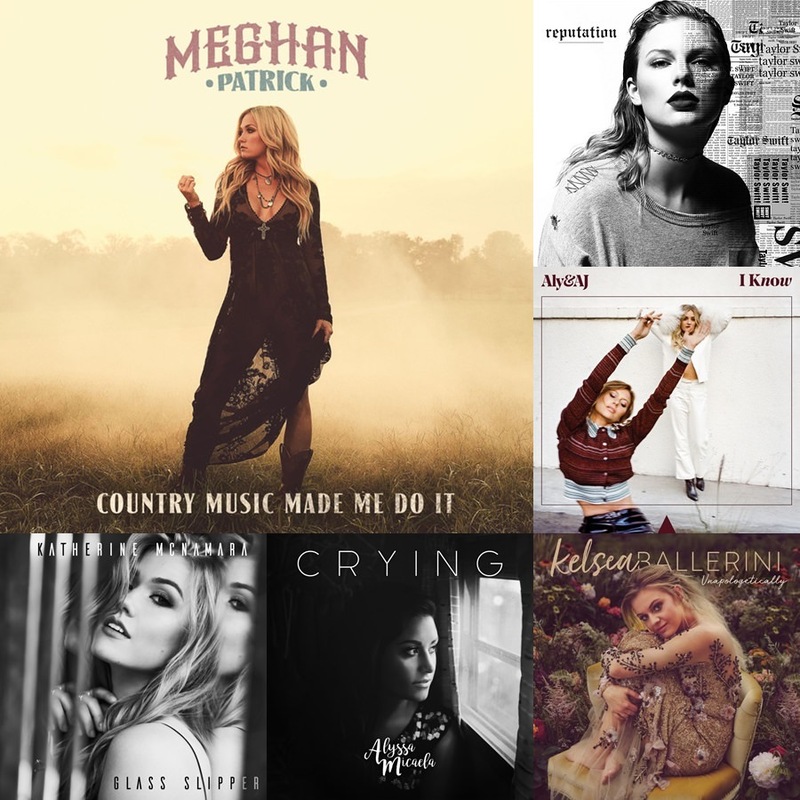 Meghan Patrick with this week's highest new entry at #2, and the other five (six) new entries (and re-entries). Edit: The next update will probably be on Tuesday. 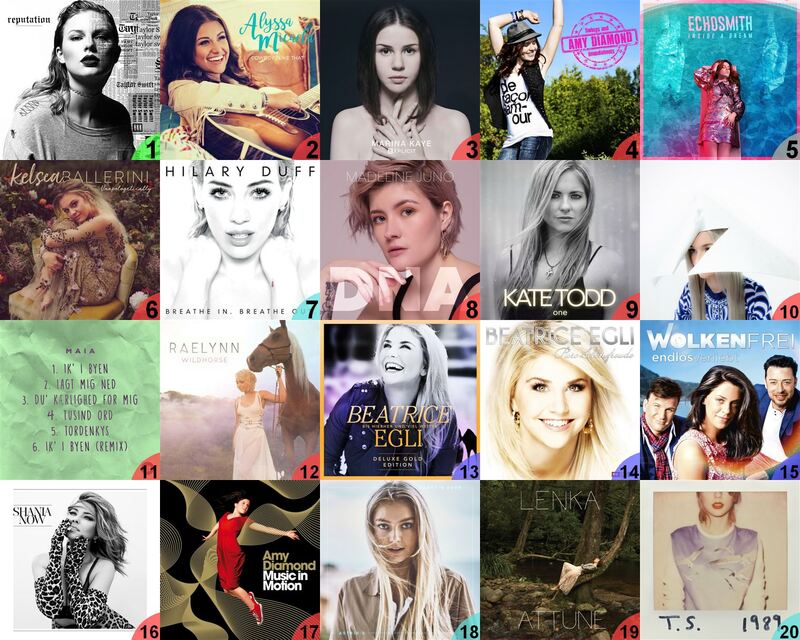 So, Taylor Swift makes a breadth invasion and now ties Avril Lavigne for most number of songs (67) on my chart! But the best song on the album fails to enter at #1, and considering what music genre Taylor started in it's kind of ironic that the new #1 is the first ever #1 with "country music" in the title. 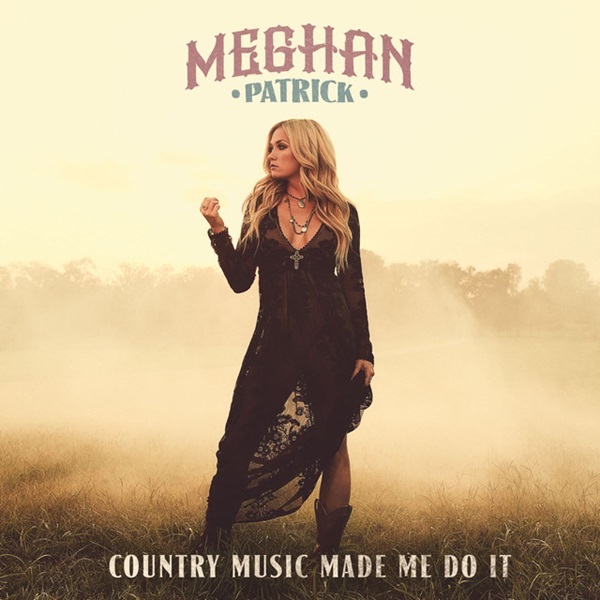 It's also Meghan Patrick's second #1 (after "Breaking Records" last year). Not much of a surprise here. 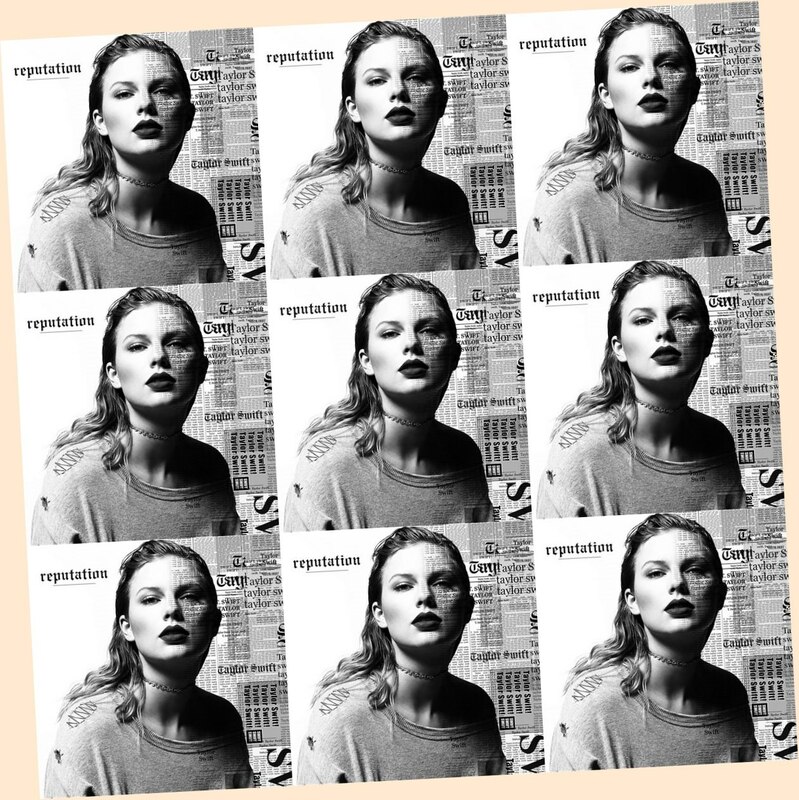 Taylor Swift usually gets to #1 when she releases a new album (the only exceptions are the debut which got to #2 and Speak Now which was blocked by Amy Diamond and peaked at #3). I haven't heard that one yet to be honest, as i think i wait for the whole album now. Glad you enjoy it, though. Awesome debut for "My Sweet Mystery"! Definitely a mixture between metal/rock and ABBA. The lyrics may be quite cheesy but i still love this song, definitely a great pick for a single. 7 ? (RE)?Hilary Duff – Breathe In. Breathe Out. Wow, instead of a 4th consecutive week with zero comments I suddenly get four comments the same week! Many thanks to Tansike, Blondini, Mainshow and trebor! Comment replies and the chart update for week 46 have been postponed until tomorrow evening. Since I'm obviously having trouble posting on Mondays lately I will just go ahead and make Tuesday the standard posting day for my chart from now on, although I reserve the right to sometimes post on a Monday if that's more convenient that particular week!